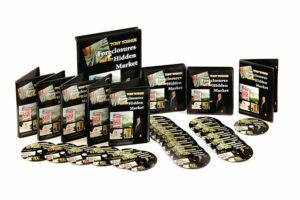 Now, for over 30 years, Tony has been perfecting and creating his own unique system, strategies, and techniques for acquiring foreclosure and hidden market properties. Because of his extreme knowledge and experience, Tony has been asked to speak at real estate and entrepreneur conventions, as well as real estate broker meetings, and national investor associations to audiences that range from 40 to 46,000. He has been a featured guest on numerous television shows, such as “Financial Freedom in America”. “American Home Buyers Alliance”, “Atlanta Live”, and “Go for your Dreams”. He is a frequent guest on radio talk shows, and has been written about in magazines and news journals. Tony has also authored material for “Best Seller” real estate books published and sold in bookstores worldwide. To this day, Tony still makes approximately 100 offers per month around the nation applying the “7 ways to create profit” and tracks them to the auction and then the REO stage and is on the cutting edge of the latest techniques and strategies for buying at each stage of the process. After a near death experience in 1993, he became truly passionate about helping people to a better quality of life.